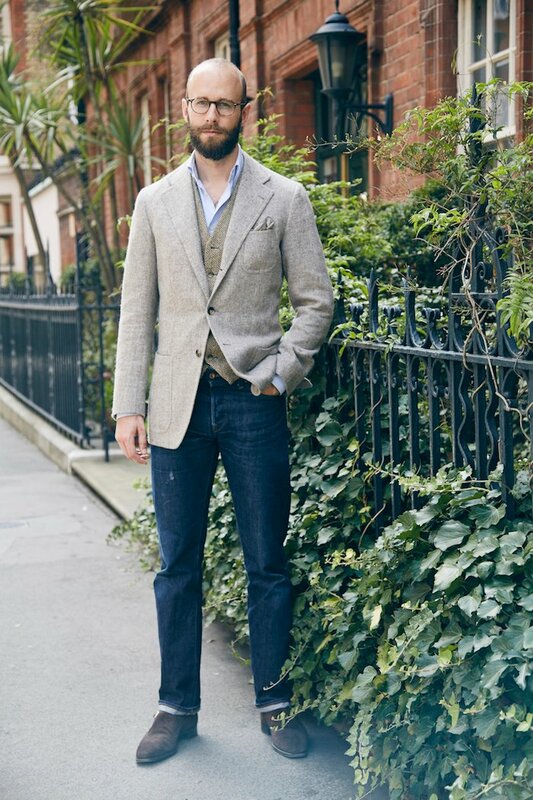 If there is one question men ask more than any other, it is how to wear a jacket with jeans. Behind this usually lies a desire to dress up an outfit without appearing too up-tight. Friends in the creative or digital industries often have this problem. When your start-up company grows from two employees to 20, how do subtly indicate your authority, or seriousness, without wearing a suit? A jacket is normally the answer, and usually the right one. But it cannot be just a suit jacket separated from its trousers. For the jacket to work, it must be similar in formality to the trousers – which normally means rougher or just more textured material than a smooth suit. This jacket was made by Neapolitan tailor Elia Caliendo in Permanent Style tweed – one of the first collaborations we ever did here on Permanent Style. 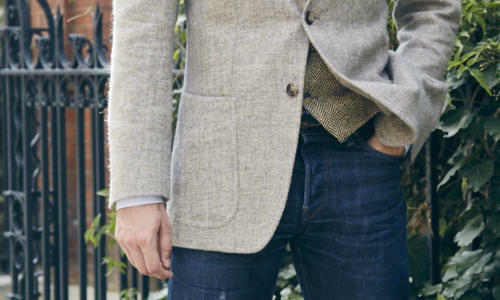 Although it is fairly smooth for a tweed, it has easily enough texture to go with denim. The casual design of the jacket – minimal structure, shirt sleeve, patch pockets – also helps to lower that formality. It’s one reason I pretty much always wear Neapolitan tailors with jeans (the tailoring goes with other things, but jeans only go with them). The outfit is made a little more tricky by the addition of a waistcoat, which can be very hard to wear casually. But as described on last week’s post on this waistcoat, it’s chunky weave and casual design make it a good match. The handkerchief is silk, but in very muted greys and browns (from Drake’s) that mean it effectively sinks into the background. Often when you wear a handkerchief in a casual outfit, this is its role: a relatively anonymous pocket filler. Cream or white linen works just as well, but if you wear silk, best to keep it as subtle as this. The bespoke jeans from Levi’s are wearing in nicely. This is the mid-rise pair of the two I had made; the other is high-waisted and would actually have been a better match for the waistcoat. Button-down chambray shirt from Luca Avitabile. Old Alfred Sargent suede monk straps on the feet. As ever, the links in the text above, and the suggested posts below this, provide more information and background on all the pieces and the artisans that made them. I highly recommend them all. You can follow the discussion on Wearing a jacket and jeans by entering your email address in the box below. You will then receive an email every time a new comment is added. These will also contain a link to a page where you can stop the alerts, and remove all of your related data from the site. Good piece Simon. More in the same vein welcome – many of your readers will not be wearing suits day to day these days but still want a smart / formal look. To be honest, this time I do not like the look you created. I cannot explain why. Waistcoat without a tie and with jeans – it simply looks wrong and is reminiscent of a waiter look. The waistcoat is the only problem I have with this. Something knitted (a jumper, or maybe a cardigan) would work better. Hi Simon, +1 regarding Rob’s comments. Regarding a casual coat to be worn over knitwear, what length would you say is best? Will this depend on the style? Also, regarding the back, would you have if plain? Or with a half belt? Thanks. How do you wear a jacket with jeans? I don’t. It’s a look which always conjures up images of Jeremy Clarkson and other archetypes of the badly dressed middle-aged man for me. Jeans are just too casual to work with a jacket in my opinion. Although I freely admit that my view my be prejudiced by the abnormally large number of men that one frequently seems to see sporting baggy jeans, trainers and an odd suit jacket. Simon, thanks for the response. The coat will be worn with jeans. My thinking is upper thigh length length , just covering the seat. Would this length work with jeans and chinos? I’ve always thought that longer coats look more formal. Also, would the half belt look work with jeans/chinos? Thanks in advance. I think you want it longer than that – a couple of inches above the knee. Unless it is a pea coat or similar style that would always be shorter. I know a few here have commented it doesn’t look right jacket and jeans. It does but I feel it is much much harder to get actually right than putting a suit on. The cut needs to be smart but not too formal; cloth needs to be a versatile colour, the shirts you wear with need to be less “business” like etc. etc. the list goes on. I have just actually bought a brown basket weave Thom Sweeney jacket. Slightly smart in cut, but patch pockets, open weave, versatile brown colour and I think it works great but I have been through so many jackets. I think it is so hard because you don’t want to look like Jeremy Clarkson as mentioned above. Like your reader above I have been coat shopping as well recently. I tried the private white Pea coat that you have recommended before. I actually think great coat for when a jacket is too formal. It’s still a casual -ish coat but beautiful smooth wool. Do you think a loose hanging half belt with buttons or sewn down half belt would look better? The latter would be non functional , more a design feature. I’m torn between a pea coat and a longer single breast coat. The coat will be worn only as a casual garment. What are your thoughts on terms of the style to go for? It’s quite a broad question, and really depends on which style you like the most. A pea coat will be less formal, certainly, but both will be pretty versatile. Hi Adam, I’m slowly moving toward a peacoat but in a casentino cloth. I’m giving thought around the details. Cuff with buttons or plain cuff? Belt or no belt. Decisions , decisions. I saw it last year on the website and thought 1100 was bonkers money, I’d rather have it made bespoke from someone like graham browne but half price it’s worth a look. Especially as it is such a statement piece and rare to look like that in RTW. I maybe being a bit snobby being it J. Crew thinking it may not be that well made. But we will see when it arrives. I can always return. When do you wear the mid-rise jeans rather than the higher rise jeans? Hi Simon, on the subject of wearing a jacket with jeans – is it a major sin to have a little of the shirt visible between the waistband and the button of the jacket? It seems almost inevitable since I can’t imagine wearing jeans at the natural waist. No, it’s fine. Inevitable, as you say. Great article Simon! As other commenters have implied, I think jacket and jeans is unfairly maligned among iGents because it is so often done badly. When put together like you’ve done here, it’s a great bridge between formal and casual, which can be incredibly useful for many settings. I’ve never quite been able to make it work with a casual waistcoat as well though, despite owning a few. I’m wondering if the issue is because mine are generally patterned tweeds, and I need something more plain? Meeting last week, ad-man (account side not creative) and marketing consultant; dress = jeans, smart navy blue textured jacket, toning shirts, no ties, light brown/taupe shoes – it’s becoming a uniform! What’s the thinking behind picking suede shoes. Is it to keep the contrast low, of just because suede (and monks) are seen as more casual? …’More casual like a cap-toe Oxford’? Did I read that right, Simon!? That would be more casual than a whole-cut, yes. I’m no expert on shoes, Simon, but seeing as a polished cap-toe Oxford is standard for business or with Morning Dress at Royal Ascot, I’m not sure how a whole-cut sits above that. Why is a whole-cut more formal for you? It’s certainly fine for both occasions, and we are of course talking about small differences here. But as a general rule, a shoe is more formal the fewer interruptions it has to the leather (all other things being equal). That is why a whole cut is usually considered more formal than a cap-toe or a brogue. I would rather wear a whole cut to black tie, for instance. When wearing jeans and a jacket, there is a fine balance to strike between carelessness and a studied informality that looks contrived. Which is why this outfit is really great. Perhaps it’s the old shoes that are key here? Well done Simon for the waistcoat pairing, nice to see a change from knitwear. I note you put a single turnup in your jeans, is that simply due to the length or preferencial to a double turn up, more typically used for small turn ups in denim. Had something like this on over the weekend but your ensemble is better – the tone of the jacket contrasts beautifully with the indigo (beautiful cloth! ), also I love your shoes, the last shape is very stylish. 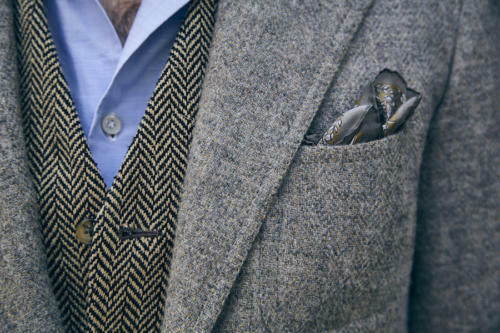 The waistcoat does work due to its texture and contrasting pattern, for some reason the five button design also reduces its formality – plus knitwear can be a bit predictable. Couple of questions; could you expand a bit more on what constitutes a ‘shirtsleeve’ design on a jacket. Additionally, with winter coming I’m considering a Covert coat – could you please advise on correct length – I’ve been told different things – thank you. Tweed is too hot for the Bay Area/Silicon Valley. Some people are doing custom shirts to show formality or authority, some of it is mimicking Eddy Cue from Apple. Kind of funny to me. I know Jony Ive’s tailor but you almost always see him in a t-shirt. It’s just way too casual in tech/creative. A jacket is really hard to pull off sometimes, almost always overdressed. Unless, you’re in biz dev or legal in tech, just not going to work. 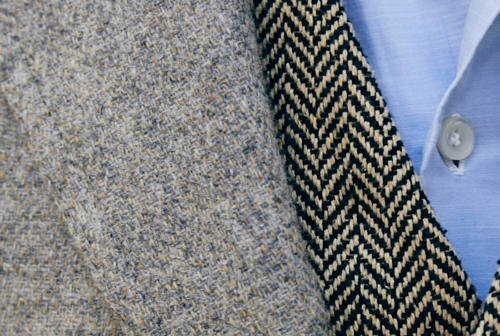 Speaking of blazers and texture – is there a difference between a hopsack blazer v. a basketweave? Are these the same thing, and are both, essentially, for lightweight, breathable jackets? 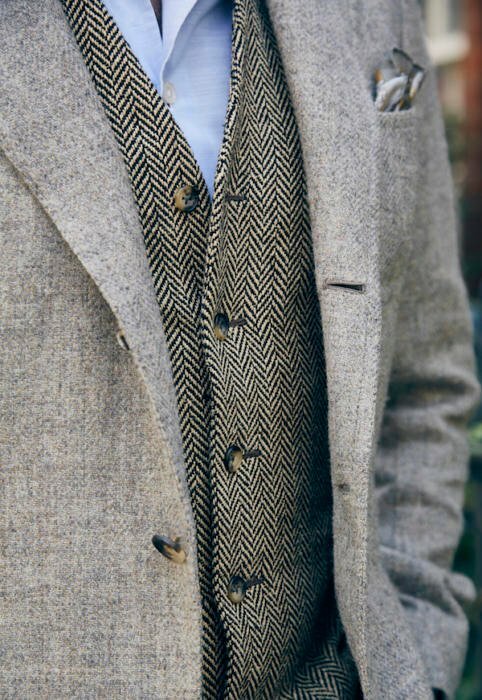 Just to add a positive comment I think this looks really good – the waistcoat adds a lot of interest/texture & is more interesting than just going for a knit & lifts it from that possibly clichéd jacket & jeans look that others have commented on. I like the outfit a lot. Very close to what I wear when I am not wearing a suit. I find jeans are the most versatile trouser to be worn on the weekend, even more than the ubiquitous beige/cream/tan chinos and the always appropriate flannels. this would work but the waistcoat destroys the look. as readers have suggested knitwear would be more appropriate. jacket is very good. see the armoury for how this should be done; unfortunately this look is too thespian. at least it avoids clarkson. Simon, I’m guessing you’re quite thick skinned! You certainly take your fair share of bashing. For what it’s worth, I think the outfit works. However, I’ll agree with some of the others. Perhaps knitwear in place of the waistcoat. Yeah. Trust me, you run a big blog, you get a thick skin pretty quickly. I think you point out one of the issues with style posts – most of time I would usually wear this with just a shirt or with knitwear (eg the Finagons that I designed). But I tend to show and write about the more interesting combinations, such as with a waistcoat. That’s very hard to get right, whereas a V-neck sweater is pretty easy, and as a result a bit boring to write about. Simon, I do wish the whiners would get a sense of perspective. I’m always grateful when someone makes an effort to look tidy. I like this very much. It’s a smarter way to wear jeans. I only wish more guys around London would look like they made an effort when not dressed in a suit. Being elegant means being elegant even when casual. I don’t do scruffy. It raises my spirits when I see this type of ensemble at the weekend. The depressing number of forty-something men I see in the West End getting out of an expensive car in jeans, old trainers and crumpled t-shirt…..
To those who reject the idea of a jacket and jeans, I would recommend visiting your posting of May 4th, 2014 with the picture of Robert Redford from the movie Three Days of the Condor. Looks pretty good to me. Mac, spot on comment. I always wonder when seeing scruffy men, whether their work is also of a poor standard. If you don’t take pride in yourself, how can you take pride in your work?! There are plenty of us who are extremely grateful for your insights and willingness to engage with readers, so please don’t let the negative comments bother you (not that I think they do!) I completely agree it’s much more interesting to see unusual or experimental combinations (that can often spark ideas about new ways to wear items) than the tried and true classics that can be found all over the Internet. Thanks again for such a great blog! This is a nice outfit. However, in order the make the best effect out the two key items jacket and denim, I would have gone for a dark brown westcoat and well polished chestnut or burgundy oxfords. As you have already noticed, PS’ readers love this kind of exercise in style! Thanks for answering the shirtsleeve query Simon and I’m with Mac on the feedback. It sounds simple I know but different tailors have advised differently re. the Covert coat length – I think above the knee but I would welcome your thoughts. I enjoy pieces like this one–very relevant for my workplace. If you’re even looking for new topics, I would appreciate an in-depth discussion of appropriate shoes for casual outfits like this. Another consideration for this look is that the jacket should be on the short side…a bit above the bottom of ones bum. I have tried this look with my bespoke tweed jackets and found they are a bit too long. My legs look like two sticks protruding from a bell. Just with a suit, there should be conformity between the jacket and trousers. So if one leans more traditional, one has to ask himself is it worth the cost to have a jacket made on the short side just to pair with jeans? I may have found a happy medium…I commissioned a 4 button navy DB hopsack with open patch pockets and shaved an inch off the length. It works great with jeans and still balances well with dress trousers. Simon, can I ask how you feel about doing the inverse of this look, i.e wearing tailored trousers with knitwear and casual non-tailored jackets/coats? I do not particularly like jeans as I find the heavy material and thick seams uncomfortable at the best of times, cold in winter and too warm in summer. Could a casual outfit with woolen trousers on the casual side of things, say a pair of grey flannel or brown tweed trousers with a lightweight merino or cashmere v neck in navy or bottle green with a white or light blue oxford underneath work as a sort of elegant casual look where a tailored jacket would be perhaps too ‘dressy’? Outerwear for this kind of rig I guess I would go with a light raincoat in the autumn/spring and a peacoat or topcoat in the winter. Love the blog by the way – it’s a consistently wonderful exercise in sartorial elegance and good taste. A joy to read. Great article Simon! One questions regarding pockets on sport jackets. I was thinking about purchasing an allround navy mtm sports jacket (half lined, soft shoulder, hopsack). 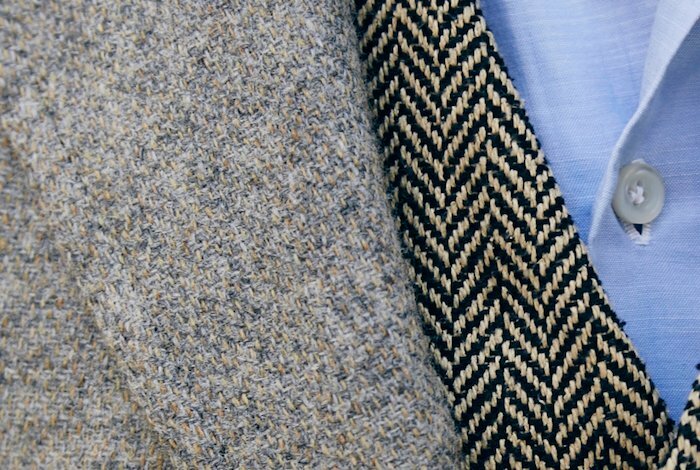 I like the clean look of jetted pockets on sport jackets (liverano), but would this work for a jacket which is going to be worn on denim as well? Or are jetted pocket too formal for such an casual outfit? Should the Neapolitan jacket/ shirt/ no-tie/ jean combo be worn with suede oxfords (Edward Green Asquith or Inverness) or suede derbies (Edward Green Cardiff or Sandringham)? Do you think that a blue Melange brushed cotton jacket, with flap pockets would look ok with jeans? I’m unsure as to whether or not the material would have sufficient texture, or if the flap pockets would appear too formal. Supposing neither of the above factors were an issue do you think it would look ok over a (grey) loopback sweat? or alternatively over a navy blue polo shirt (would this be too much blue)? Thanks for your reply Simon – helpful and much appreciated. no belt Simon? Is it because you’re wearing a waistcoat here? You perfectly describe my situation as MD of a digital agency – considerably older (late 40s) than my employees. Jackets all the way now and I have been reading your numerous articles about chambray shirts which I do see cross the line between casual dress and formality. I can’t find one that I like for under £100 online. Would I achieve a similar effect with an end on end say from Harvie and Hudson or similar? Or is the chambray bringing something entirely different? Thanks in advance. Love the look! Are the pockets on the grey jackets slightly narrower on the top than at the bottom, almost like a cognac glass shape? I have a navy tweed jacket and I’m wondering which color should my jeans have? Navy and navy isn’t maybe the best match but what about black, grey or lighter blue? I understand black isn’t the color choice for trousers in a smarter look but what about in a casual look for jeans? When wearing a jacket with jeans, should the jacket be slightly shorter? I’m guessing a typical suit jacket that covers the seat would be a tad too long. Are the Neopolitan jackets shorter than “standard” jackets? Thanks for the speedy response. Any guidelines on how much shorter? A couple of inches? Or a bit more/less? Sorry, one final question. Do the normal sleeve length rules still apply? I.e. A bit of shirt cuff showing. Hey Simon, I’ve seen individuals (e.g. Jake from Anglo-italian) wear light coloured jeans with navy jackets (https://www.instagram.com/p/BW9lnWTHno4/?taken-by=cadeandco) with great success. I’m wondering would such a palette work in winter? Navy Flannel/tweed top and light coloured jeans or is this only summer appropriate? Thanks Simon. Is there a reason why jeans would’t work with a flannel jacket? Do you happen to know what your high waisted Levi’s measure in the front rise? I’m on the lookup for a high-waisted denim and I saw one that measures 12.75 inches for the front rise. I’m not familiar with high waisted denim- is 12.75 high waisted enough or is this too much……sadly I cannot try them on. For this Caliendo jacket, I know you wrote that it has shirt shoulders/spalla camicia but they seem almost like a natural shoulder compared to the flashier shirt shoulders (no roping, but just very pronounced shirring) Elia has on his instagram page. Could I get your thoughts on this? Thank you. I see – lightweight linen will show more prominent wrinkles than medium weight cashmere and wool., that makes sense. very informative – and timely (for me). Thank you. Would you go for smaller or bigger armholes for these kind of more casual jackets Simon? Hi Simon, What material would you recommend for a Napolitain blazer to be worn with light or mid wash jeans (and maybe white/off-white) ? Thank you very much for all your work and time ! Thank you Simon good call! And in navy to also be worn with light jeans would you also recommend something in cashmere ? Or maybe something like hopsack ? Thank you so much ! Yes I would, though there would be much more of a risk there that the jacket would be too smart for the jeans. Browns and greens would be more casual and much safer.